This entry was posted on September 22, 2011, 17:51 and is filed under TOI. You can follow any responses to this entry through RSS 2.0. You can leave a response, or trackback from your own site. Uwe, might be a good idea to add that archived logs in FRA are not compressed. Unless they are sent there by RMAN. At least in 10gr2. We send archived logs to a separate area and then back them – compressed – in FRA with RMAN every second hour. One thing you could pass to development that would be useful is the ability for the arc processes to save archived logs in RMAN compressed format: that would definitely be welcome. Nice article Uwe. Thanks for sharing! A very nice article that gives a close insight to create a database on 11g, in a simple way, with maximum security, the management of FRA and as well the Flashback technics. Hi Uwe, really excellent to the point article. I did not new that control mirror can go to FRA. A Big Thanks for sharing with us. Just discover this post (Thanks to your tweet ;-)): That’s a good one ! 2) If “backup recovery area” (to tape) fails.The next “backup recovery area” will take care of the previous failed bkp automatically. Fahim, even if the device behind /u02/fra is just one single disk, it is still allowed to use parallel channels – it is not very helpful, though. But /u02/fra may as well be a mountpoint that has a lun from a SAN underneath with many spindles, so many parallel channels can be used for a fast backup. And of course, DB_RECOVERY_FILE_DEST can also point to an ASM diskgroup. I find your articles very helpful. Thank you for posting them. 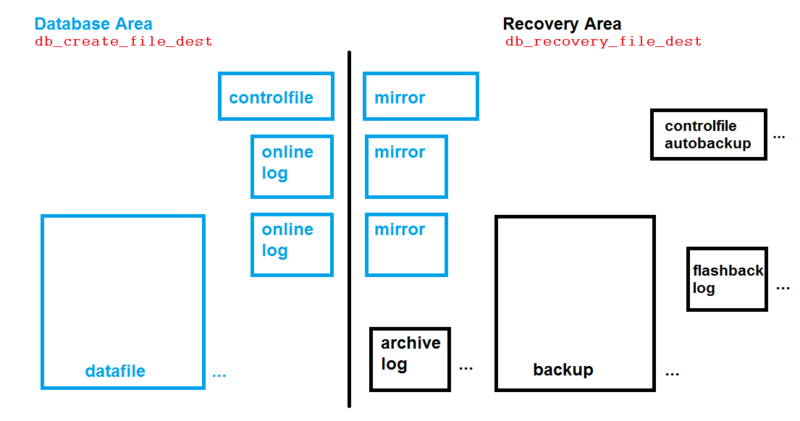 I am converting our 11gR2 databases to use a fast recovery area, and to flashback database. I currently keep a single copy of the archived redo logs. In the database I am using to test the FRA I have two copies of those logs, one in the FRA, and one outside of it. The ones in the FRA are managed well by Oracle. When I use OEM 12c to backup the database and its archived redo logs I edit the resulting RMAN script and add statement, “delete noprompt archivelog all backed up 1 times to disk like ‘/t07/admin/GPAIDT/arch/%’;” to delete the non-FRA copy. What are your thoughts keeping these logs in these locations? I like the redundancy of now having multiple copies of them, but having to remember to add this statement to each backup job in OEM leaves me vulnerable to space issues if I ever forget it. In your opinion, does the benefit of now having two copies of the logs justify the trouble of maintaining the non-FRA copy? Hi Bill, thank you for the comment! Definitely, archived logs must be protected similar to online logs as long as you may need them for a recovery. So if your recovery area is not providing redundancy, you should continue the present strategy although it adds some effort. If on the other hand your FRA resides e.g. on RAID 10 storage or on an ASM diskgroup with normal redundancy, you may go with archived logs there only. Thank you for your opinion, Uwe. Maybe I will be a student in one of your classes some day. I think that would be a good learning experience. Nice Post as normal, but I have doubts about FRA. I have fresh database, will take full RMAN backup daily. I have created RMANBACKUP directory to allocate the rman backup. enabled the archive log on my DB, and create arch directory to allocate the archivelogs. What is the gain to enable FRA? If you are backing up to the FRA, you cannot simultaneously duplex/multiplex the backup to another disk location. I have another question on archived redo logs in the fast recovery area (First was on 1/15/2015). What is the right way to get rid of the copy of the now obsolete archived redo logs that are in the fast recovery area? Do I manually delete them by using an operating system command as I would delete the copy that is outside the fast recovery area? I have enabled the FRA. but due to space limit we decide to change the destination of FRA to new mount point. what steps i have to follow could you please help? I want flashback disable and it is already disabled.